Here we are at the final classic Headmaster in the Titans Return deluxe series. Wolfwire aka Weirdwolf is my personal favourite of the three original Decepticon headmasters and this deluxe figure doesn't disappoint! 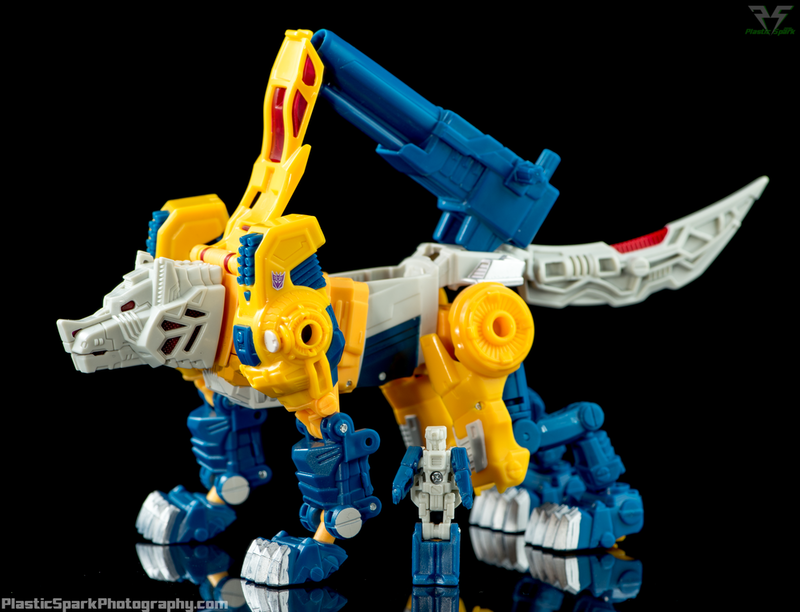 Weirdwolf's beast mode is impressive given his size and budget. The aesthetic is on point taking some great cues from the original design as well as throwing in some modern details. He's got an incredible range of articulation with ball joints and hinges in multiple points on all 4 legs as well as ball jointed ankles albeit with some limitations. He's even got a ball joint at the base of the neck allowing him to tilt and turn his head just enough to add a ton of personality. Weirdwolf's cannon can mount on top of his wolf mode with a seat for a Titan Master driver, or it can be mounted underneath his body for a more streamlined appearance. I've been having a lot of fun trying to get natural dog-like poses out of him and while there is a limit to what he can achieve I think the overall articulation is very impressive given his price point and mainline availability. I do wish that the tail had a swivel joint in the centre to arc it up for a more excited dog pose or down for a sad expression as dogs emote so much through their tails. Robot mode is a real treat as well. Weirdwolf's signature pylon shoulders and hip armour are intact and he cuts a real mean silhouette. I do think there's something just ever so slightly stumpy about him though... His transformation requires the wolf torso to compact and I feel like it compacts just a little bit too much. The same great articulation is present on bot mode, but you are definitely going to notice the limitations of the shoulder ball joints in bot mode far more than you did in wolf form. If you un-clip his wrists you can get a bit of a swivel that I find particularly useful for posing him with his sword over one shoulder. He can just barely hold his sword with 2 hands but I would be worried about damaging his hands in the long run as they are quite thin. Being a sword wielder I wish he had wrist swivels but it is what it is. His cannon can be held in his hand or mounted to his shoulder, personally I like having him hold it in his hand using one of the side pegs for a different look. I think with some tinkering Weirdwolf could be improved but I found him to be the most enjoyable of the three classic Decepticon Headmasters in the new Titans Return format. Definitely a recommended purchase from me, he's a ton of fun and next to Brainstorm he's probably the one I take off the shelf the most to play with. If you have any thoughts or comments please let me know down below! On a side note, I'm trying to hit 1000 likes on the Facebook page before the end of the year and if you liked this review and haven't already signed up I'd be so happy if you did! Follow the blue link below or use the ribbon on the right side of the page to click that like button!